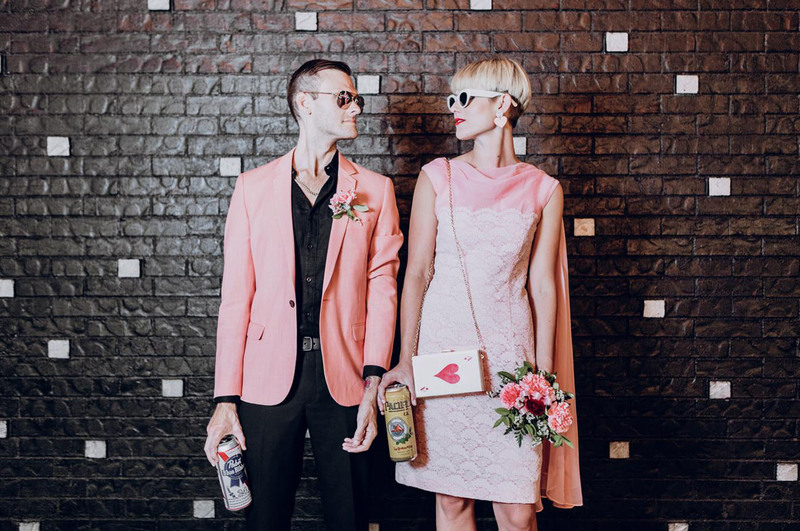 When Anna + Steve decided to get married, they knew pretty quickly that a big wedding was NOT for them. 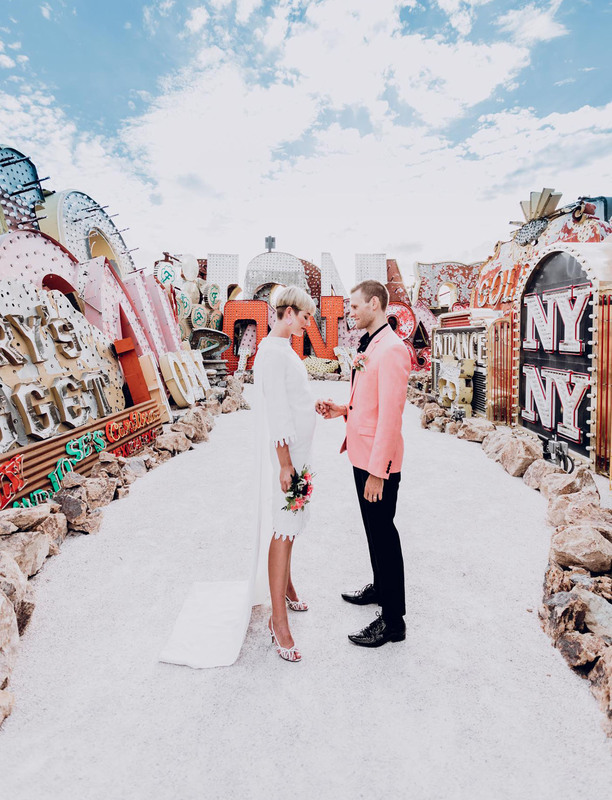 Initially, they were not going to tell anyone and elope in Vegas, but they were worried about hurting their families by doing just that. 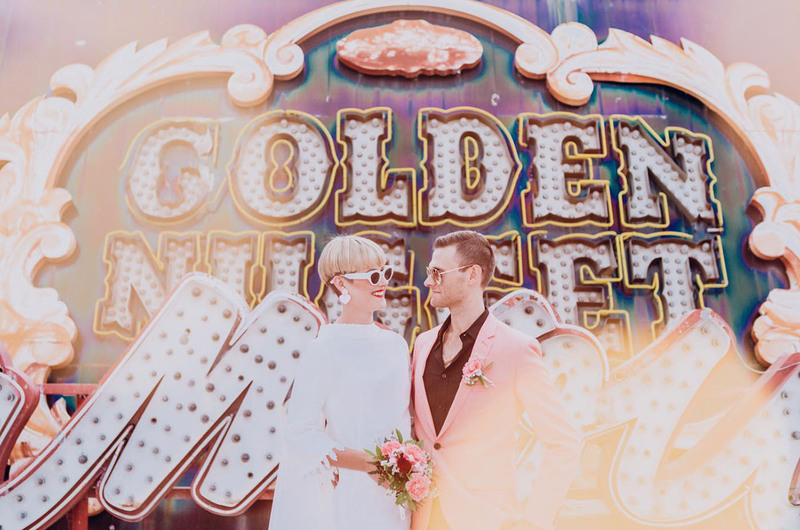 So, they made a compromise by having a small, secret backyard ceremony with their immediate families in their hometown of Newcastle, Australia + then flying to Las Vegas to renew their vows and surprise everyone else with the news! 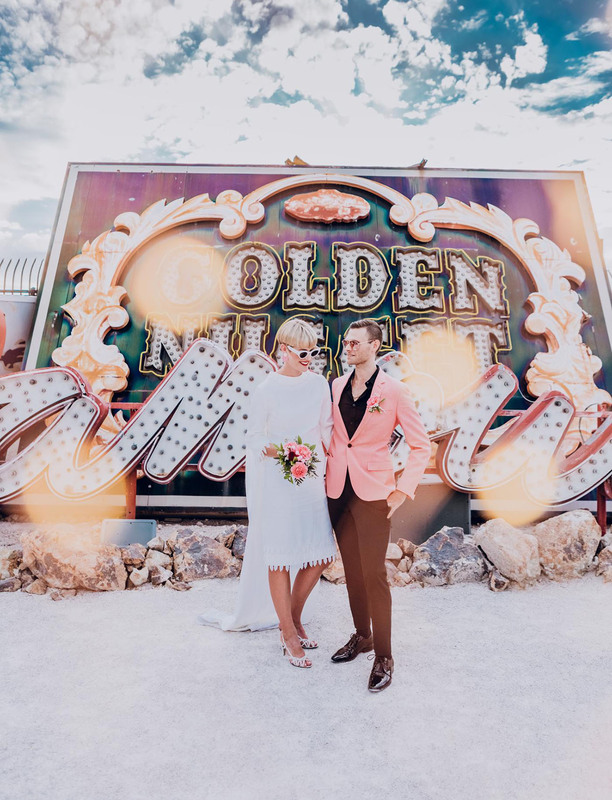 Having never been to Vegas, they relied a lot on their photographer, Amberlight Collective, to show them all of the best spots and she did not disappoint! 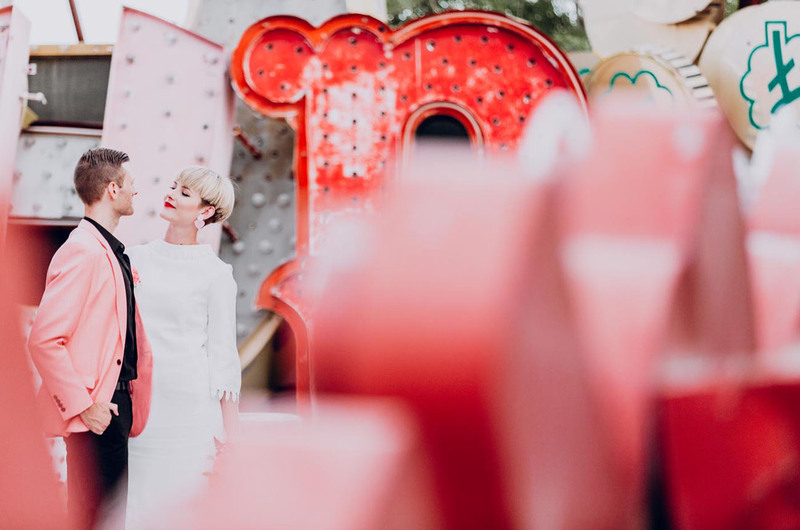 Anna shares: When our photographer asked why we picked Vegas I believe I told her that we were excited about “the vaguely depressing aura of old casinos, access to all you can eat buffets, the kitsch history and the possibility of seeing some kind of diva who has been trapped into a 500-show concert series.” Unfortunately J.Lo and Britney weren’t performing while we were there but otherwise Vegas delivered on all other accounts! 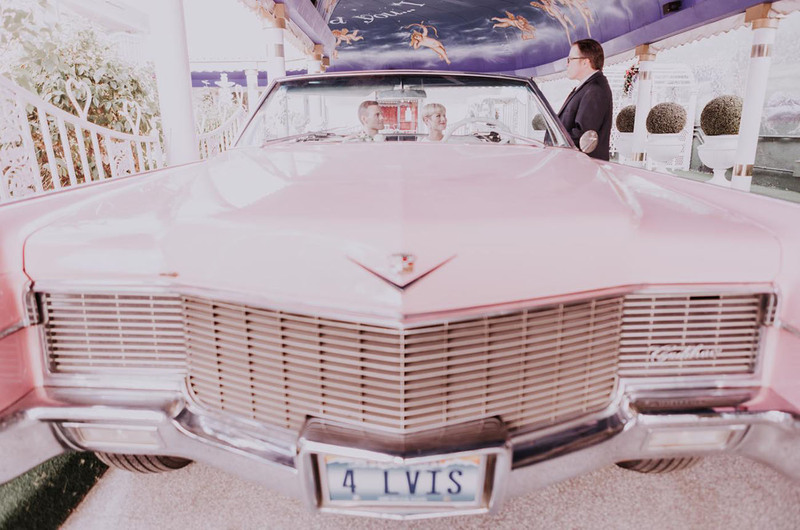 We picked the pink Cadillac drive-thru option for the wedding because…why not? Despite being chosen for maximum LOLs, our second ceremony was still incredibly lovely and moving, thanks to the wonderful staff at the Little White Wedding Chapel. 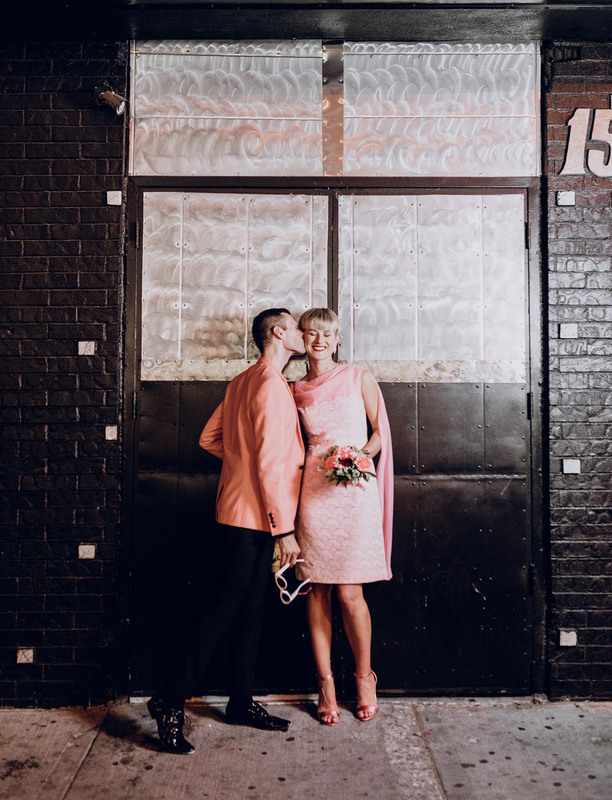 Anna tells us: The best thing about having two weddings is that we were able to have a very small, emotional, family-oriented day at our backyard wedding in Australia, as well as a day to ourselves that was just ridiculously silly and fun. 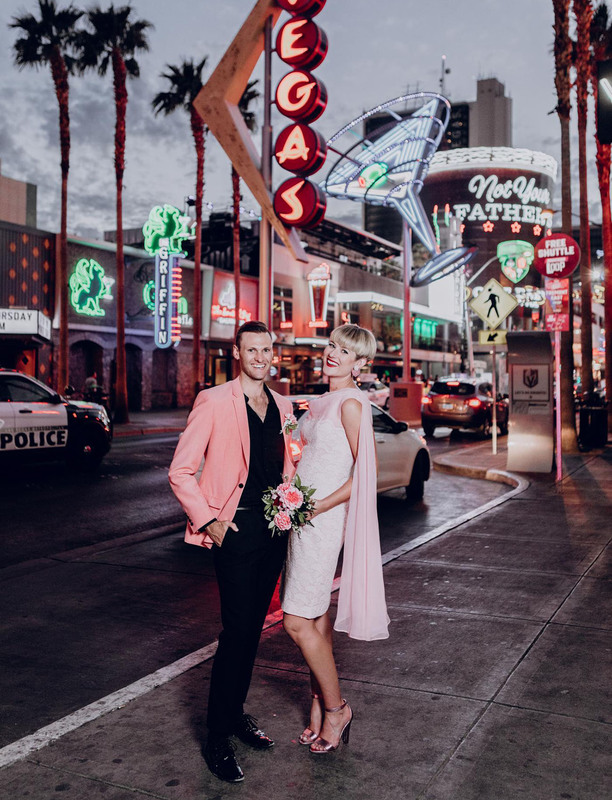 Our Vegas elopement really was just about fun from beginning to end. We started the day drinking cocktails by the pool at the Tropicana hotel, then lazily got ready while eating In ‘N’ Out Burger. 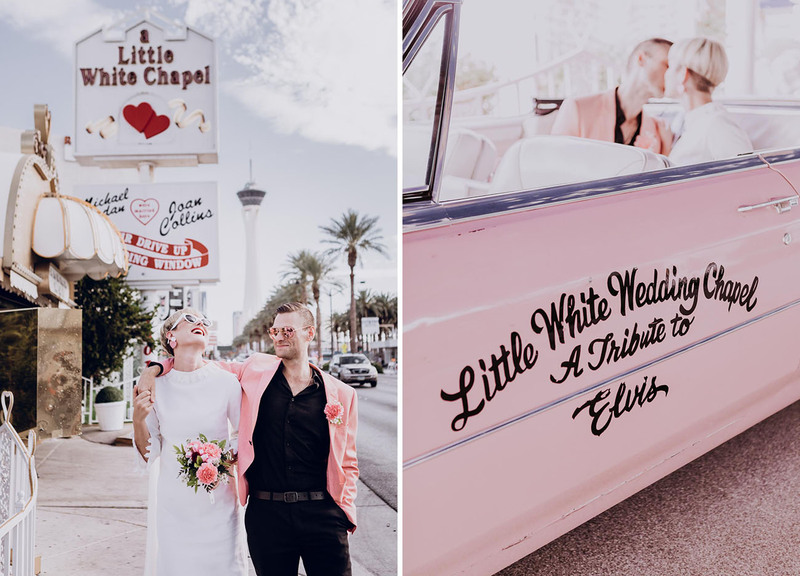 We drove to the Little White Wedding Chapel in our giant, painted RV camper (which we were taking for a huge desert road trip after the wedding). After the ceremony our amazing photographer took us around Vegas to see the sites and take photos. 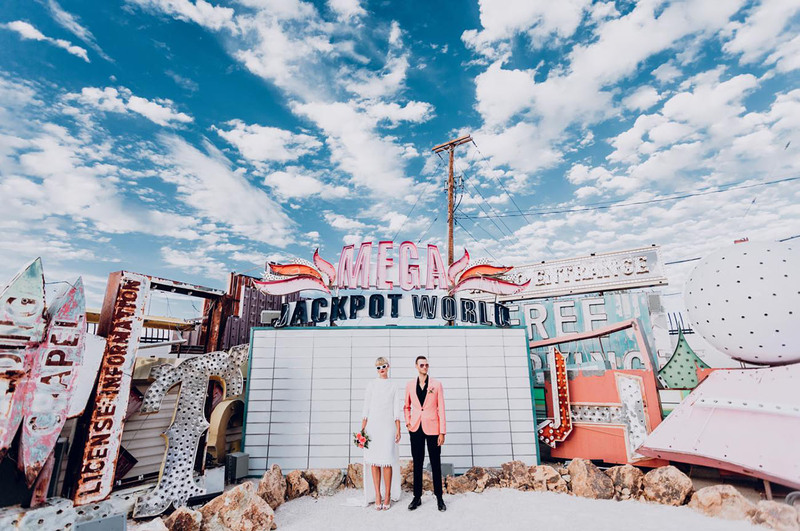 We chose the spectacular Neon Museum (a huge outdoor collection of old casino signage) and the old downtown precinct for our photos and had an absolute blast. Anna actually bought her dress off eBay about 5 years ago, with no intention of it being her wedding dress! She was planning on dyeing it or re-selling it…but as soon as they had Vegas locked in, it seemed PERFECT! 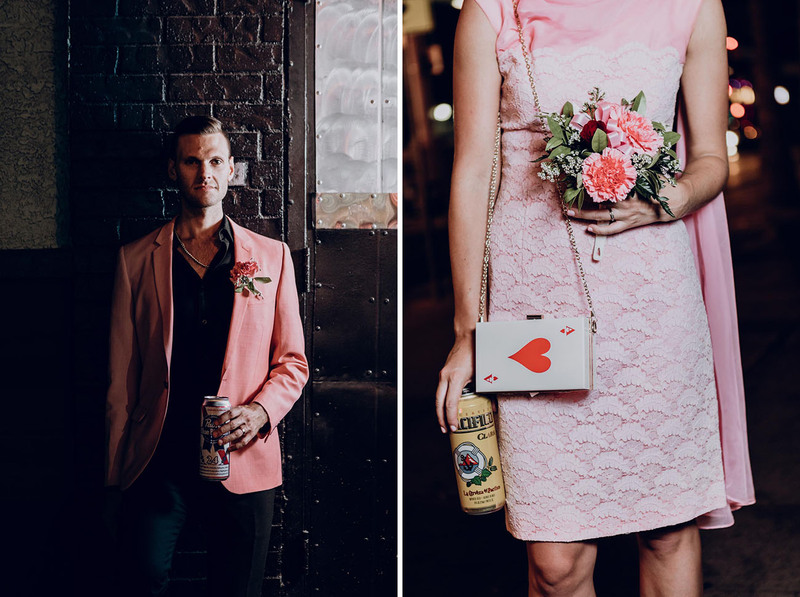 After all the photos were taken, they finished with a celebratory dinner + a ton of Mai Tais at a seriously NEON place. 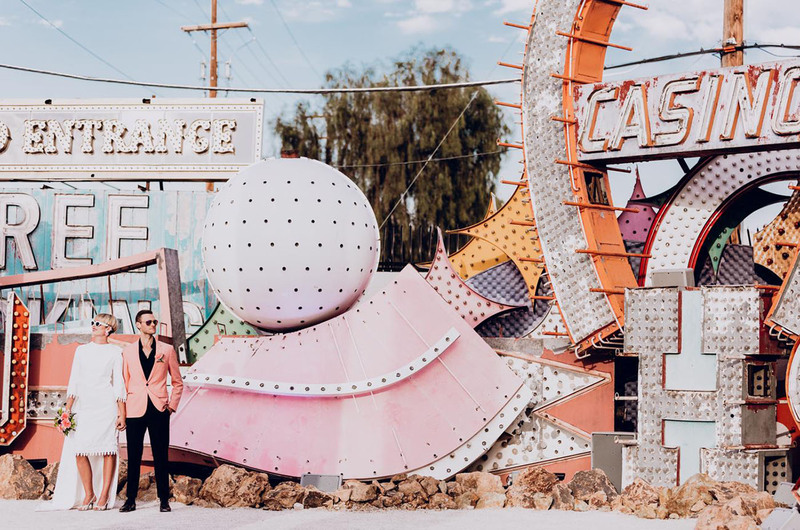 Totally Vegas, and totally perfect. 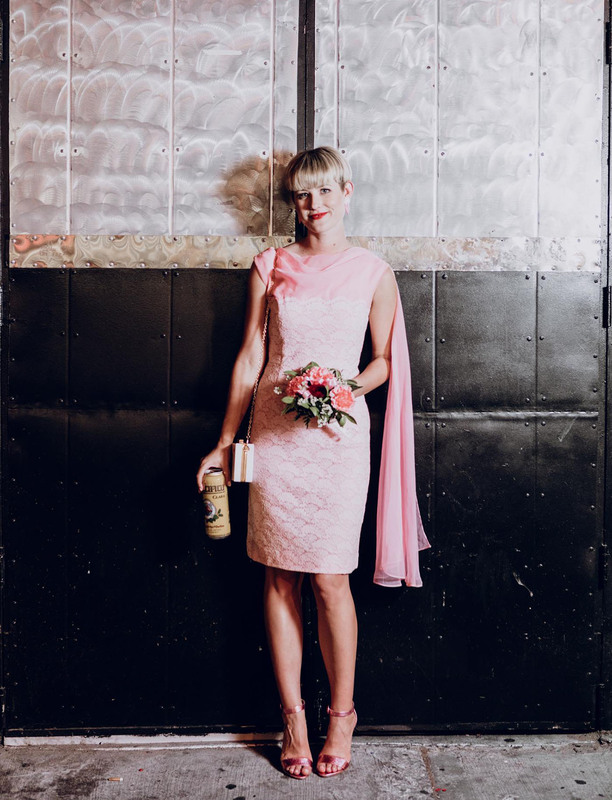 Anna tells us: The pink dress was my sister’s—picked up from a flea market—and was a last minute addition to my luggage, in case anything went wrong with the white dress. I wasn’t intending on wearing it, but as the day progressed I thought “why not!” and got changed in a side street in our RV. 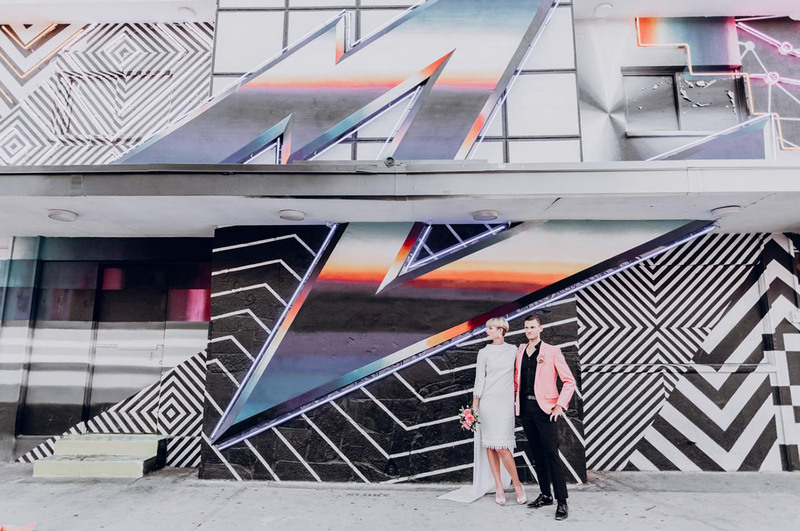 It ended up being more comfortable and suited the vibe of Downtown—so we got lucky with that! Steve’s outfit inspiration was very much “dodgy Vegas hustler” meets both Nick Cave AND Nick Cage. I think we nailed it! 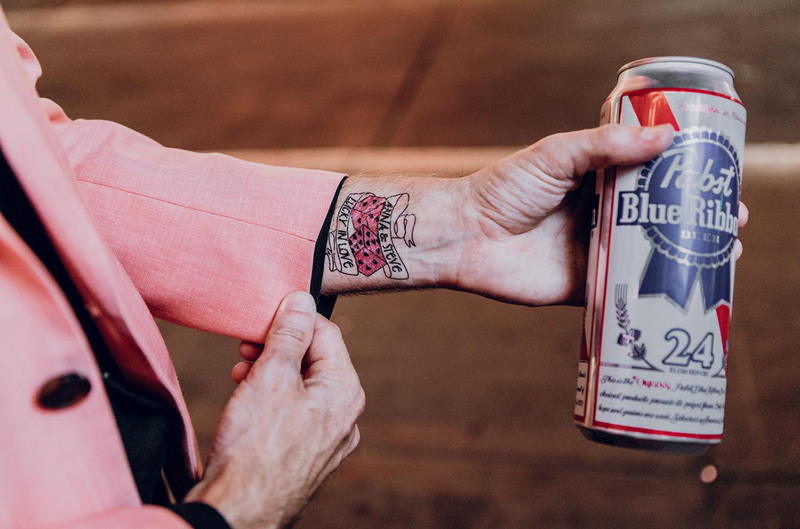 Some friends that we had told about the wedding had some personalized, Vegas-themed tattoos made up as a wedding gift, which flawlessly incorporated into Steve’s wedding look. 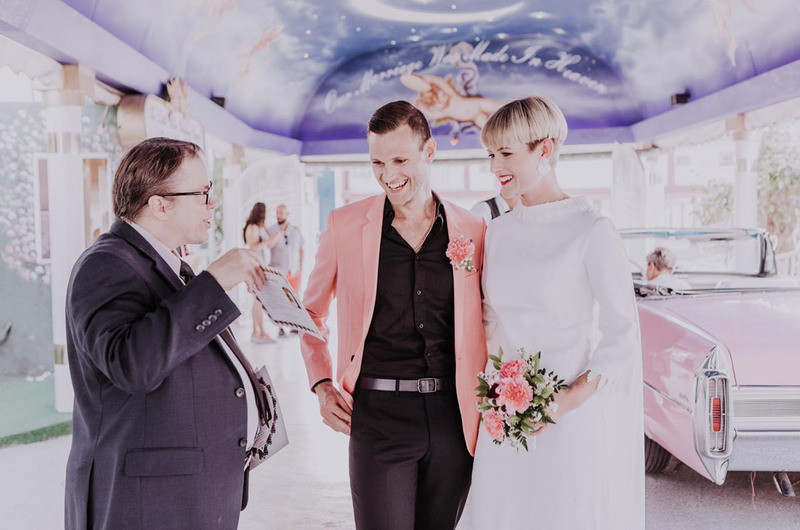 Apart from choosing trusted vendors, I was struggling to think of other useful advice for others thinking of eloping somewhere you've never been. We were really cavalier about it and it all just seemed to work out by luck. 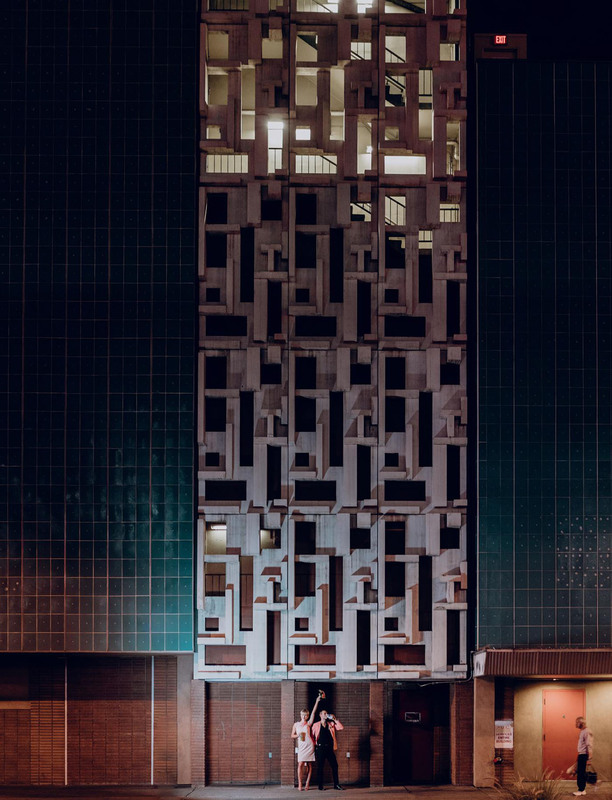 But maybe that's my best advice—leave yourself open and don't have set and clear expectations—that element of flexibility is where you can really create something special. 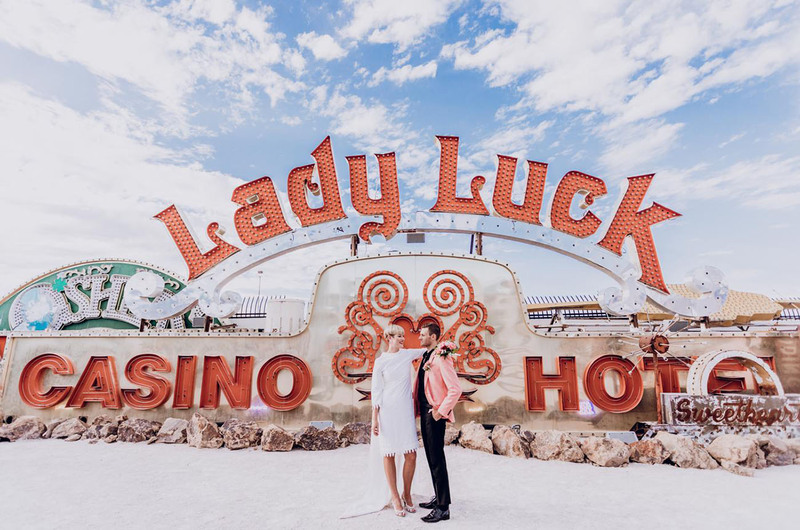 Here’s to lady luck + to the two of you!! Cheers! 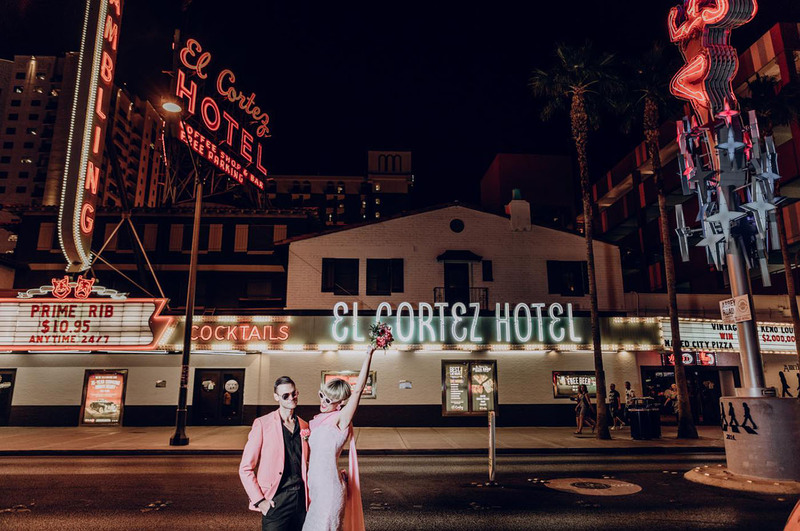 What a fantastic location for an elopement. I love these photos, I bet it was such a fun day. 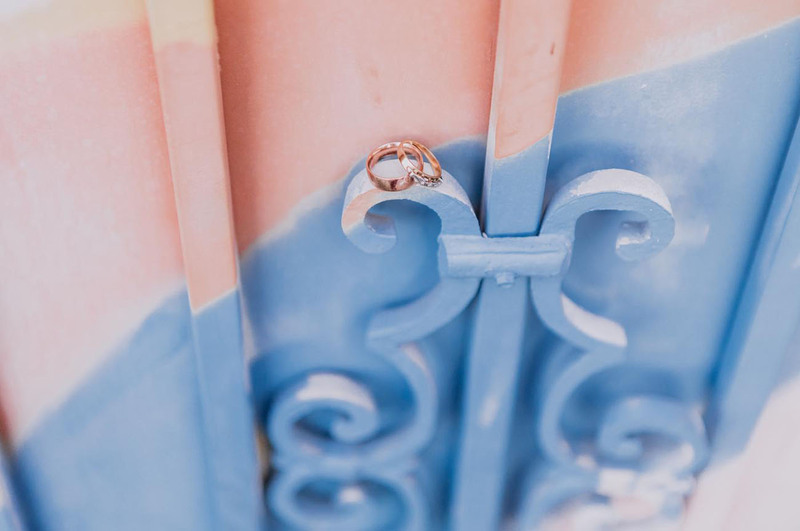 Love love love the location ! !